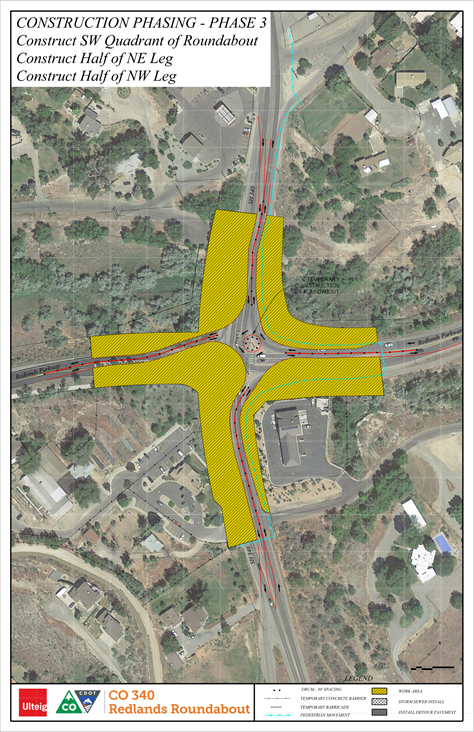 MESA COUNTY—Those traveling west of Grand Junction can expect a major traffic shift starting the morning of Tuesday, July 10, as crews will open traffic to a temporary roundabout configuration at the intersection of CO 340 (Broadway) and Redlands Parkway. The temporary roundabout will allow traffic to move through the intersection while the project team completes the final phases of the project. CDOT and contractor Elam Construction are moving into phase 3 of this project, and to prepare the intersection for the temporary roundabout, crews will be working quickly Tuesday morning to remove the existing traffic control devices, and place them in the northwest quadrant. Detour paving will also take place. Allow extra commute time to as traffic adjusts to the new temporary roundabout configuration. Traffic control will be in place. Vehicles 9 feet or wider—including semi trucks—are not allowed in the work zone during this project. Find help navigating the roundabout. In this latest phase of work, crews completed curb, gutter, sidewalk and embankment work; placed road base material; patched with asphalt; built concrete colored wall; and paved with concrete. Upcoming work includes installing Americans with Disabilities Act (ADA) -compliant ramps; curb, gutter and sidewalk work; placing wing walls and head walls; asphalt milling, paving and overlay; and permanent concrete paving. The anticipated completion of the project is November 2018. From 2010 to 2015, there have been 28 crashes at the CO 340 and Redlands Parkway intersection. The vast majority of these involved rear-end and left-turning incidents. Roundabout-type intersections are extremely effective at reducing these types of crashes.